This post is less of a about publishing information than it is a request for information from the readers. 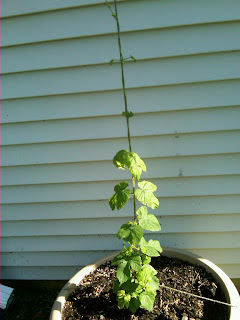 Over the past couple weeks, a strange issue has crept up in my attempts to grown hops. If you have any ideas, or suggestions that might be able to help, please post it here as a comment or shoot me an email. 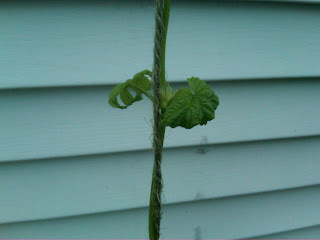 Back in late April, I planted two hop rhizomes in the backyard just for the fun of it – one Sterling and one Centennial. Not wanting to plant the hops directly in the ground, I elected to plant the rhizomes in containers (following advice from a BYO magazine article). Within a month after planting, the Sterling plant broke through the surface and began to rapidly climb (the Centennial taking an additional month before making an appearance). However, about 2-3 weeks ago, I’ve noticed that the upper leaves of the Sterling plant have started to become sparse and developed a curled up or wilted appearance. I have no idea what is causing this and I've been scratching my head as I search for potential fixes for the problem. Below are a couple photos of the plant. 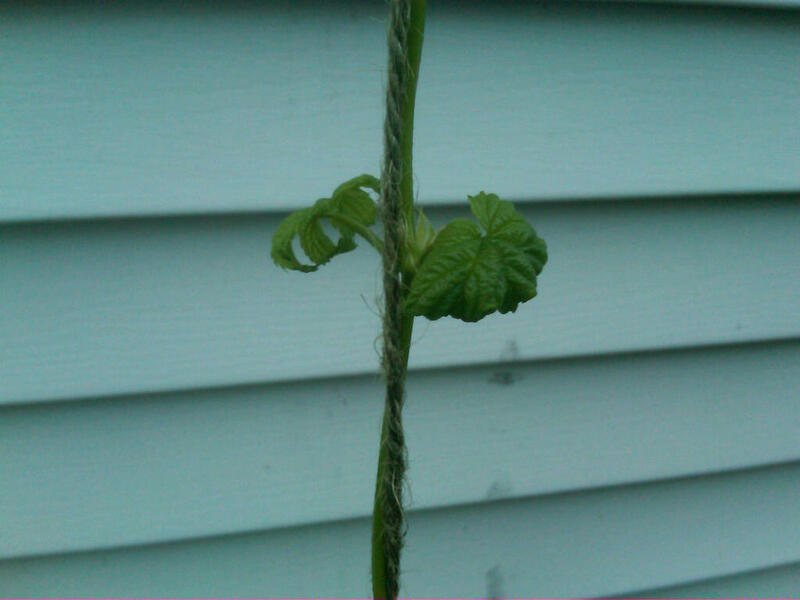 First Year Sterling Hop Plant – Notice how the lower section looks lush and healthy, while the upper portion is wilting and sparse. Close up of the upper leaves of the Sterling hop plant. The plants are watered regularly, is in the sun for 8+ hours a day, and the soil is ideal (mixture of potting soil and compost). Wilt disease – a microbial disease that attacks the plant’s vascular system – is one possibility that was suggested by a coworker who is a bit of a horticultural expert. If it is indeed wilt disease, the only solution I have is to pull the plant and destroy it or risk the disease from spreading to other plants in the garden. Not an ideal solution. Has anyone else seen this before in their hop plants? What else could be afflicting the plant? I am obviously not enthusiastic about tearing the plant out and starting over, so any suggestions, hypotheses, or ideas are certainly welcome. The site didn't have a direct answer to my problem, but it is very informative and a great resource if your trying to troubleshoot a hop problem. It's hard to tell from the pics, but it doesn't look like there's any discoloration from a disease. My hops get wider spacing between the leaves as they grow faster and taller, so that's normal. If they're wilting, it's likely "regular" wilt - the kind plants get from not enough water and too hot conditions. As new hop plants, they may not have enough of a root system yet to absorb enough of the water to keep it cool during the warm hours of the day. Make sure to water in the morning and add some mulch to help the soil retain some of the moisture. If they're slow growing, it's likely because the hops are developing its root system still and/or there's a mineral deficiency in the soil. Try a diluted tomato fertilizer or a compost tea.